A Bitcoin & Cryptocurrency WordPress Theme. Crypto is the perfect theme for cryptocurrency based blogs. Apart from regular blogging features, Crypto has many specific features for cryptocurrencies that make it the most sought-after cryptocurrency theme by crypto bloggers, traders, commentators, and spectators. It provides multiple ways of monetization and can be used to cover blockchain, BitCoin, AltCoins and any other topic from the cryptocurrency world. Crypto theme is unique in many ways. It’s designed from the ground up to fulfill the needs of cryptocurrency blogs, but it can also be used for many other niches. Our engineers spent a lot of time on the drawing board to make sure that Crypto satisfies the needs of every blogger. The most critical piece of information in any financial market is the price. Crypto has the capability of displaying live coin prices for various cryptocurrencies. Using this feature, you can cover news, conduct analysis, and provide your users with accurate and timely information about the crypto world. There are over 1300 cryptocurrencies in the world right now, and covering them all can be overwhelming for your readers. 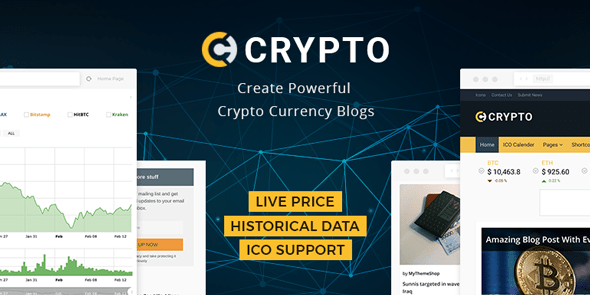 Crypto lets you create dedicated pages for individual crypto coins, using which you can consolidate all the important information, historical data, news, and trends for the coins in the same place on your website. Winston Churchill said, “The farther back you can look, the farther forward you are likely to see.”. That is true of the financial market as well, including cryptocurrencies. Crypto’s historical price data feature lets you share the price history of cryptocurrencies, using which you showcase essential trends and share your analysis with your readers. We don’t know how cryptocurrencies will be priced in the future, but currently, they are priced against regular currencies. The Crypto theme allows you to compare different crypto coins against different currencies. You can use this feature to conduct analysis, provide commentary, and predict trends for your readers. Widgets are a great place to share information with readers. Crypto is designed with many custom widgets but there are 2 dedicated widgets for Crypto which will help users to convert coin price and show historical data. The intention behind creating the Crypto theme was to give cryptocurrency enthusiasts the perfect theme to write about their passion. Using Crypto, you can create a blog about an individual cryptocurrency, or cover the entire spectrum of cryptocurrencies with ease. Crypto isn’t only capable of blogging. You can easily create an online store with WooCommerce and Crytpo will work perfectly with it as well. You can use the WooCommerce integration to sell cryptocurrency based products or anything else with ease. The homepage is the most important page of your website, but making it engaging and keeping it fresh is a challenging task. The Crypto theme features drag and drop sections that eradicate this issue permanently. Using this feature, creating new homepage designs is as easy as clicking your mouse and dragging. To keep your readers engaged, Crypto features 2 distinct post layouts for homepage. You can choose just one of the styles for all your posts, or use the different styles for different homepage sections. A theme designed for cryptocurrencies wouldn’t be complete if it could not display the pricing for various cryptocurrencies. Crytpo is integrated with many APIs using which you can show the real-time pricing of a variety of cryptocurrencies on your website. Cryptocurrency enthusiasts are not reading about the latest coins only on their desktops. They are using their phones, tablets, and other devices to stay up to date with the fast-changing crypto world. The crypto theme uses our optimized fluid responsive framework which ensures that Crypto works perfectly on devices of all sizes. All the elements of the theme resize intelligently to provide the perfect user experience for all devices. A new crypto coin doesn’t just come into existence, an ICO (Initial Coin Offering) is what helps launch a cryptocurrency. Crypto theme can list ICO details with its ICO custom post. You can also display the information about all the ICOs on a single page using the ICO archive capability built into Crypto. Crypto has an inbuilt, feature rich slider which you can use to grab users’ attention. You can use Crypto’s slider to feature any content like your internal posts, new currency launches, breaking news, and more. Millions of people are searching for cryptocurrency related things on search engines. With Crypto’s SEO prowess, you can make sure that you are part of the action. We have designed Crypto to be SEO Ready by following Google’s and other search engines’ technical guidelines. Traffic is useless if your theme doesn’t load fast enough for your users’ to stick around. We have designed Crypto with clean, bloat-free code. Hundreds of man-hours have gone in to make Crypto as fast as possible, even under extreme visitor load. You can make money with Crypto in various ways, including ads. Crypto supports and is fully optimized for AdSense, which is the biggest ad network in the world. We have set the ad areas where they will generate the most clicks while not affecting the user experience in any way. Parallax scrolling can create an immersive and engaging experience on your website. Crypto fully supports parallax scrolling for blog posts and home pages, using which you can create header images or featured images with parallax scrolling. We made sure that customizing the Crypto theme is a delight by including our friendly and advanced options panel with the theme. Using the options panel, you can customize almost everything in Crypto including the colors, changing the post options, export or import your configuration, and more. MyThemeShop focuses immensely on creating themes that are made with clean, optimized, and well-commented code. The Crypto theme is no exception to that, and we have spent countless hours in optimizing Crypto for exceptional performance. Cryptocurrencies are currencies without boundaries, and your visitors will be global as well. The Crypto theme is ready to serve visitors from around the globe with its translation readiness. Translating the theme is easy, and all you have to do is edit the provided language files. Google Fonts gives you hundreds of fonts to choose from on your website while maintaining performance standards. It’s no surprise that we include the entire font library from Google Fonts in Crypto so that you can choose the perfect font combination for your website. You can morph the Crypto theme into any look you prefer with unlimited color options. You choose colors for a variety of elements and style them in many ways. Choosing colors for any element is easy and quick through our friendly control panel. Apart from colors, you can also customize Crypto’s backgrounds. You can choose from solid colors, or use one of the included background patterns. If that doesn’t give you a look you desire, you can even upload a custom background of your choice. Apart from the theme, Crypto also allows you to style your content in many ways with our custom shortcodes. We include many custom made shortcodes that you can use to create stylish buttons, lists, dividers and more to organize your content and make it more engaging. We are obsessed with speed, and one of the ways we achieved high-speed loading in Crypto is using Ajax loading. Ajax is a technology which can help load content in the background without refreshing the page. Using this technology, we have made Crypto’s loading times lightning fast while maintaining a positive user experience. Building a strong personal brand is the motivation behind many blogs, and Crypto is here to help. Apart from providing many options to style the content and theme, Crytpo also gives you access to a beautifully designed author box which you can use to display your bio attractively. Mobile users will make up a large chunk of your readers, and it’s important to serve them in the best way possible. To make the best use of the limited mobile space, Crypto shifts the navigation menu off the screen. The menu is arranged vertically and still easily accessible with a simple touch for the perfect user experience. With Crypto, you can review coins, currencies, exchanges, and more in style because of the complete compatibility of Crypto with WP Review Pro. Using WP Review Pro with Crypto, you can create stunning, SEO friendly review boxes that attract eyeballs and attention. When a visitor lands on your website, it’s an opportunity to convert them to a long-term reader. Using Crypto’s compatibility with WP Subscribe Pro, you can create and embed high converting subscription boxes on your website that will consistently grow your email list. There is so much happening in Crypto world that it can be hard to follow and process. Using Crypto’s compatibility with the WP Menu Menu plugin, you can organize your content in a way that your users feel most comfortable with. You can also use WP Mega Menu Pro’s stylish menus to highlight the most important content on your website. Fonts are an integral part of any website. Keeping this in mind, we designed Crypto with advanced typography controls. Using our easy to use control panel, you can customize the fonts of almost all the elements on your site. Apart from fonts, you can also set the colors and sizes of the respective elements. We built Crypto with advanced Import Export options so you can experiment with Crypto’s settings without the worry of breaking anything on your website. You can backup your settings in a single click and even restore them as easily. Using this feature, you can try out a variety of new settings on your website or even transfer your existing settings to a new setup of Crypto. Lazy loading is another useful technology that helps in improving load times dramatically. We have built Crypto to natively support lazy loading so that you can enjoy blazing fast performance without the use 3rd party plugins. Crypto’s beautiful design and SEO power are bound to attract visitors, but it’s your job to keep them reading more. One of the tools that you can use to achieve this is the related posts feature. Using this feature, you can insert relevant content just below your posts, so your readers read multiple posts on your website. Using icons with your posts is an easy way to make them beautiful and engaging. Crypto includes the vast set of icons from Font Awesome, which makes hundreds of icons available to you in a single click. You can even customize the icons with unlimited colors and sizes to use in multiple creative ways. Other themes might ignore pagination, but not Crypto. We have included 4 different types of navigation in Crypto so you can give your users multiple ways to navigate content on your website. Widgets are useful blocks that you can insert in the widget enabled areas of your website. Crypto ships with many custom-made widgets, each of which fulfills a specific purpose. Using WordPress’s widget drag and drop, you can insert any widget to the widget enabled area in just a few seconds. If you like to dive in and customize your themes before using them, you will be happy to know that Crypto fully supports child themes. You can easily create a child theme and make modifications that will be retained, even after theme updates. All our themes are famous for installing in a single click and Crypto is no exception. Simply upload the theme zip file and hit install to complete Crypto’s installation. We regularly update Crypto to introduce new features, improve speed, and have better security. Using our theme and plugin manager, you can update the Crypto theme in a single click. Crypto is loaded with features, but we don’t want them to be overwhelming for you. To help you understand and navigate Crypto’s features better, we ship Crypto with high definition narrated tutorials. These tutorials explain Crypto’s features in detail, and also discuss common issues and how to solve them. Good documentation is a critical part of any software product. It’s an invaluable tool for users and developers alike. We include extensive and well-organized documentation of Crypto with every installation. Our support for our products is second to none, and the testimonials prove it. When you buy the Crypto theme, you are backed by the assurance of our WordPress experts who are available 24x7x365 to assist you with any issues you might have.